We have two agents in our office who have been in your shoes. The military life is a distinctive lifestyle that requires preparation. These two have been there and they understand your needs. “We understand the military moving procedures (PCS – Permanent Change of Station). We too have moved multiple times and therefore we understand separation from family/loved ones and why it is important to be prepared,” shared John & Tammy. They understand all of the branches of the military and they even understand international moves because they too have had to do that. 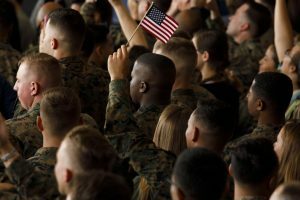 Because of their military service but also their career in real estate, they know how to navigate such things like VA Loans, Basic Allowances for Housing, military relocation process, Permanent Change of Station (PCS) and event Temporary Duty Station (TDS). John further shared how his experience as Chief has helped him to better understand airmen’s needs. “As a supervisor, First Sergeant and Superintendent I was always concerned about the well-being of my personnel. Understanding the programs and processes designed to make transitions easier for troops ultimately allows for a happier/easier integration of the Airmen.” elaborated John. He takes this into consideration when working with all of his clients and makes sure they are linked to the resources they need in order to feel comfortable with the full real estate process. Tammy expanded on this and shared how their real estate service corresponds with their military service. “One of the key things that not everyone understands about the military is that it is a service. The Air Force has three Core Values of 1) Integrity first 2) Service before self 3) Excellence in all we do. I try to still live by these values in my personal and professional life. In Real Estate these core values are the foundation of what I want our service to our clients and customers to be. ” expressed Tammy. If you are ready to make a move and you’d like the service and care John and Tammy offer their customers, then connect with them today online or call 307-631-1211 for John and 307-631-8621 for Tammy. They specialize in residential real estate sales, new construction, land and townhomes.